One of the ladies at Stampin Addicts very graciously sent some card fronts (and envelopes!) that she no longer can use, so that I could turn them into full cards to send to Operation Write Home. 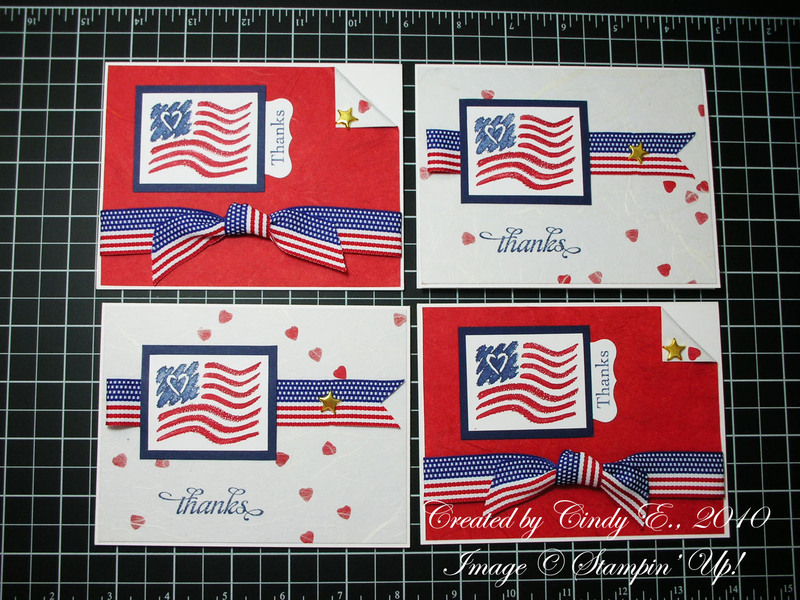 OWH is a fabulous organization that collects hand-crafted cards from crafters, packs them up, and sends them to deployed service members so that they can stay in touch with their loved ones at home. It means SO MUCH to these heroes to be able to send their kid a birthday card, or their mom a Mother's Day card, or their spouse an anniversary card. There are no card shops in Iraq or Afghanistan, or wherever they are deployed, so we try to help 'em out, by helping spread the love. 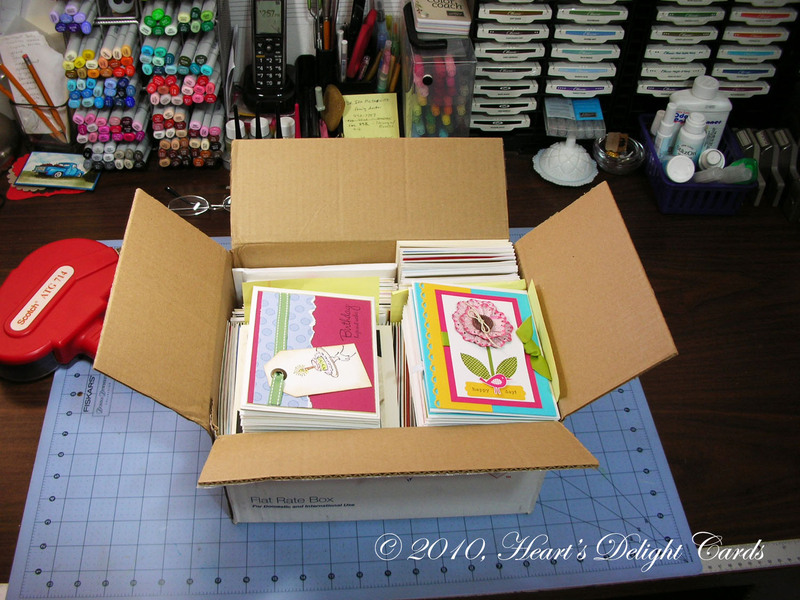 In addition to the card fronts I received, I had a huge stack of cards and card fronts with retired stamps or cardstock that I donated as well. So, in that box, all stamped with the OWH logo on back, and tucked in their envelopes, are 166 assorted cards, from Christmas, to birthday, to love you/thinking of you, to thank-yous. And on top of the pile are four more "Anyhero" cards. These are from me, personally, to any service person, thanking them for their service to our country. I truly am grateful for their sacrifice and my family's freedom! P.S. I haven't forgotten the basket tutorial. I had to clear my three craft tables of this project first! What a wonderful project. I know you have brightened many days...from the servicemen that get to send them to the loved ones that receive them. Great job!! Wow that's a lot of work! Great Job! Wonderful project. I have donated to them many times, however this year I have not been able to make many cards to send... shame on me. I will have to get busy. Thank you for taking the time to do this for our service men and women. I know it means a lot to them. Wonderful cards for a great organization. Thank you for your hard work on it! You have totally motivated me to make an effort for this cause. This is just wonderful and thanks for doing all this! !